No matter where you go in India, upma is a very popular favorite breakfast food. It was originally derived in South India but is also found in Maharashtra and Sri Lanka. Essentially, upma is a thick, porridge-like breakfast dish that is made from course rice flour or semolina that has been dry-roasted. When you try this recipe, you can determine if you like it and the many ways that you can prepare upma. This tasty dish can be eaten for breakfast, brunch, or as a snack and is so wholesome you can even make a full meal of it! To begin, heat a griddle or flat pan on a medium flame and roast the semolina lightly. Stir the semolina frequently and do not allow it to brown. Once it is done, place it on a tray or platter and keep aside. Heat the oil in a pan and add the mustard seeds, curry leaves, and green chilies. When the spluttering stops, add the grated ginger and stir well. Cook for 1 minute. Add the onion and fry it until it is both translucent and soft. Add the tomatoes and cook till they are soft. Add the hot water, turmeric, and salt, to taste, and bring to a boil. Add the roasted semolina, a little at a time, stirring constantly to prevent any lumps from forming. Simmer and cook till the upma is like a very thick porridge. Turn off the flame. Squeeze the lime juice over the upma and mix well. As mentioned, upma is a versatile dish so there are many variations of it. First off, it can include refined ground wheat and rice or whole wheat as well as vermicelli, durum wheat semolina, or pearl sago. Veggies can be added to it as can beans, and nuts are not out of the question either as some types will include cashews and peanuts. 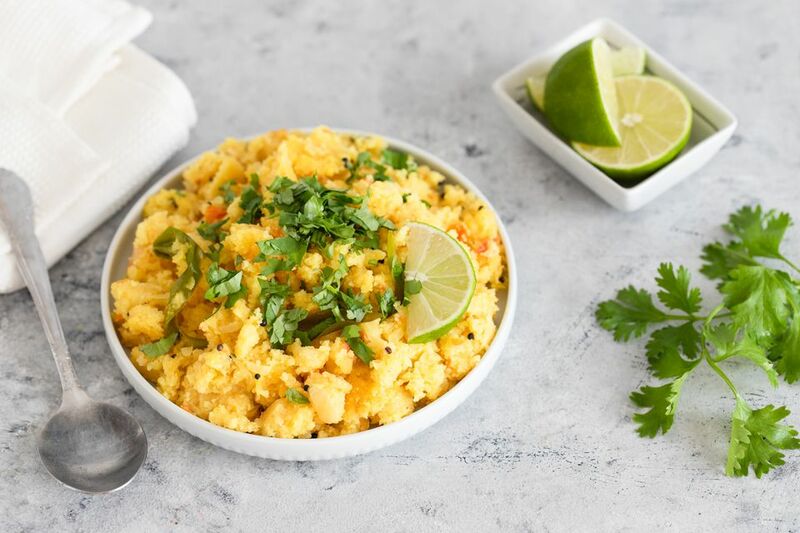 Masala upma, which is also known as kharabath, for example, includes sambar masala or garam masala as well as red chili powder. In Tamil Nadu and southern areas of Karnataka, rice upma is a popular dish. Another variation of it contains grated coconuts. That is common on holy days or other times when people avoid eating onions. That type of upma is smeared in ghee before serving. It can be made using rava, which is made from whole wheat grain. Other variations include rice and oat upma.